InterHarmony® International Music Festival presents the final concert in the InterHarmony Palm Beach Series. InterHarmony® International Music Festival presents a chamber music concert featuring pearls of the piano trio repertoire with Festival Founder Misha Quint (cello), and IIMF guest artists Andrzej Grabiec (violin) and Gerald Robbins (piano) on Sunday, March 13th at 5PM. The program is an illustration of the romantic tradition of the Piano Trio, performed by soloists, that brings to mind the famed Heifetz – Rubinstein – Piatigorky Trio. This is the final concert in the first season of the InterHarmony Palm Beach Series. For tickets call the box office at 561-362-0003 or order online with credit card at palmbeachestheatre.org. In existence for almost two decades, InterHarmony has become one of the important festivals worldwide, and the fastest growing. Anchored in Italy and Sulzbach-Rosenberg, Bavaria, Germany each summer, the festival boasts a new Outstanding Guest Artist Series that features stars such as Alfred Brendel and Vadim Repin. Now, fresh from a run at the InterHarmony Concert Series at Carnegie Hall in New York, IIMF's founder and cellist Misha Quint brings some of the best of these programs with him to Palm Beach. For more information about InterHarmony® International Music Festival, please visit www.interharmony.com. Rachmaninoff's early Trio élégiaque No.1 in g minor, is a study in barely restrained yearning. The piano's rising four-note theme swims on a sea of thirty-second notes whipped up by the cello and violin. The mood shifts fluidly between melancholy desperation and wistful nostalgia, trapped in a cycle of longing, returning again and again to those four bittersweet notes, like a prayer. Dvořák's "Dumky" trio (Piano Trio No.4 in e minor, Op.90) is a compact, but unforgettable musical odyssey. In this freely structured collection of six "dumky," Ukrainian ballads and laments, the cello, violin and piano sing the songs of a small people torn between great empires. This dark, Bohemian fantasy invites the listener deep into a forest of gnarled melodies, where sudden clearings open and mad dances whirl. Shostakovich's Piano Trio, No.2 in e minor, Op.67 strikes a tragic tone. The year was 1944, the composer's good friend Ivan Sollertinsky had died and the country was nearing the end of hard war. Here, after the public bombast of his Leningrad symphony, was a private expression of doubt: anxiety for the future and sorrow for the past. Its premiere made a devastating impression – the audience wept openly and demanded encores. It was immediately banned. Pianist GERALD ROBBINS has distinguished himself internationally as a soloist having performed throughout the world in virtually every major music center including New York, London, Paris, Amsterdam, Bonn, Munich, Athens, Frankfurt, St. Petersburg, Belgrade, Tel Aviv, Jerusalem, Rio de Janeiro, and Tokyo. He has appeared with many major orchestras such as the Los Angeles Philharmonic, Los Angeles Chamber Orchestra, London Philharmonic, Royal Philharmonic, BBC Symphony, and its affiliates, London Mozart Players, the City of Birmingham Symphony Orchestra, and the Portland Chamber Orchestra, with such conductors as Zubin Mehta, Sir Neville Marriner, Edouard van Remoortel, Harry Blech, Okku Kamu, Jorge Mester, Lawrence Foster, Kenneth Klein, Kypros Markou, Yaacov Bergman, and Louis Fremaux. A champion of neglected romantic repertoire, Gerald Robbins has received critical acclaim for his solo recordings on the London-Decca, Genesis, Orion, MSR Classics, Bridge, and Black Box labels, among others. His world premiere Genesis recordings of Litolff and Reinecke concerti, performed in collaboration with the Monte Carlo Opera Orchestra conducted by Edouard van Remoortel, elicited such praise as "Gerald Robbins's technical prowess is phenomenal", "a keyboard voice of true eloquence", "a first class bravura performance." In addition to his solo activities, Mr. Robbins has distinguished himself as a chamber musician in collaboration with many eminent musicians such as violinists Nathan Milstein, Aaron Rosand, Pinchas Zukerman, Ruggiero Ricci, Mark Peskanov, Bronislaw Gimpel, Kyung-Wha Chung, Mayumi Fujikawa, Haroutune Bedelian, Glenn Dicterow, and cellists, Zara Nelsova, Joseph Schuster, Nathaniel Rosen, Stephen Kates, Frederick Zlotkin, James Kreger, and Richard Markson, among many others. A co-founder with Glenn Dicterow of the Lyric Piano Quartet, Mr. Robbins records and tours with this ensemble. He is also an accomplished conductor and co-founder with Kenneth Klein, of the Westside Symphony Orchestra of Los Angeles now known as the Beverly Hills Symphony. He was a co-founder of the London Concertante, an ensemble that specialized in 18th and 19th century concerto repertoire. He has appeared as guest artist, several times over the years in Bargemusic, a distinguished chamber music series in Brooklyn, and as a guest artist with members of the New York Philharmonic at Lincoln Center in their celebrated chamber music series. Mr. Robbins received many important awards throughout his career including a major prize at the Van Cliburn International Piano Competition. During his studies at the University of Southern California, where he received his Bachelors and Masters degrees, he assisted as pianist for the string master classes of Jascha Heifetz, William Primrose, and Gregor Piatigorsky. He is presently living in New York where he is an Artist-in-Residence with the Lyric Piano Quartet at Queens College CUNY, and is on the faculty at the CUNY Graduate Center. He is affiliated with the Hoff-Barthelson Music School in Scarsdale, NY, and is a member of the chamber music faculty at the Manhattan School of Music in New York City. Tickets are $40 and can be purchased by calling the box office at 561-362-0003 of Palm Beaches Theatre or online at palmbeachestheatre.org. The Palm Beaches Theatre is located at 250 South Ocean Blvd. Manalapan, FL 33462-3312. InterHarmony® International Music Festival opens a new concert series in the most exciting location of Palm Beach, Florida area. The inaugural concert will feature Founder and Music Director Misha Quint in a cello recital on January 30, 2016 at 7PM at Palm Beaches Theatre. The pianist for the evening will be Irina Nuzova. They will present a program of music that pushes the limits of the cello repertoire, questioning the boundaries between instruments, genres and cultures. 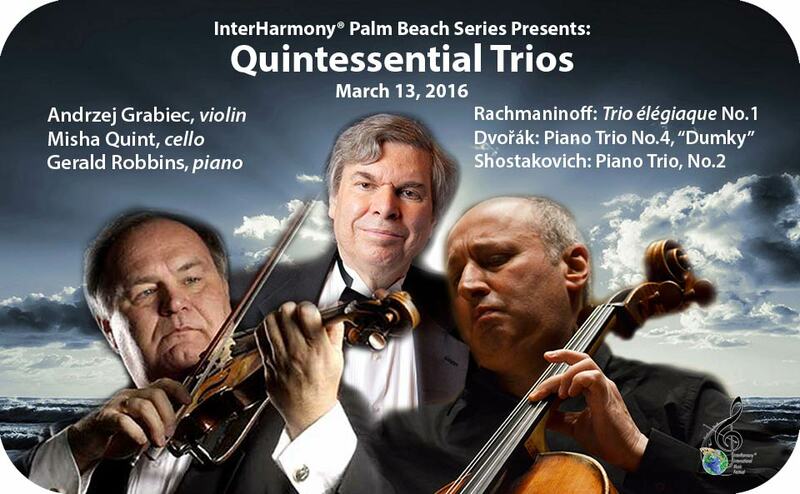 The InterHarmony Palm Beach Series continues on March 13th, with a chamber music concert featuring pearls of the piano trio repertoire with Misha Quint (cello), with special guests Andrzej Grabiec (violin) and Gerald Robbins (piano). For tickets call the box office at 561-362-0003 or order online with credit card at palmbeachestheatre.org. In existence for almost 2 decades, InterHarmony has become one of the important festivals worldwide, and the fastest growing. Anchored in Tuscany, Italy and Bavaria, Germany each summer, the festival boasts a new Outstanding Guest Artist Series that features stars such as Alfred Brendel and Vadim Repin. Now, fresh from a run at the InterHarmony Concert Series at Carnegie Hall in New York, IIMF's founder and cellist Misha Quint brings some of the best of these programs with him to Palm Beach. For more information about InterHarmony® International Music Festival, please visit www.interharmony.com. Classical music is anything but static. With time, technique and, above all, inspiration, what was once unimaginable becomes a reality on stage. Join Quint and Nuzova as they show how the possibilities of cello music have expanded by incorporating other repertoires and cultures in a search for beauty, wherever it might be. The January 30 concert features pieces originally written for other instruments (like Schnittke's Suite in an Old Style and the Franck Sonata), music from ballets and operas (Prokofiev's "Adagio" from Cinderella and Rimsky-Korsakov's Flight of the Bumblebee), and works of cultural cross-pollination (Shchedrin's Russian tango, "In the Style of Albéniz," and Bruch's Kol Nidrei, which enriched the Romantic idiom with Jewish melodies). On March 13th, he returns with Grabiec and Robbins to offer a stormy program of "Quintessential Trios" by Dvořák, Rachmaninoff and Shostakovich in a Sunday matinee concert at 5pm.